This creamy Cajun Chicken Salad gets a kick from a custom blend and crunch from crisp celery. It’s great in lettuce wraps or on rolls. Chicken Salad is one of my favorite lunches. It’s hearty and filling while not being heavy. You know what I mean? It’s perfect for packing, for entertaining, for just snacking on while you read a book and eat it out of the bowl with a spoon. This Cajun Chicken Salad, with only four ingredients, is a particular breeze to pull together. Make it even easier by cooking the chicken in the slow cooker. If you use frozen chicken tenders, they cook in a just a few hours and practically shred themselves when you take the tongs to them. I love to do that! 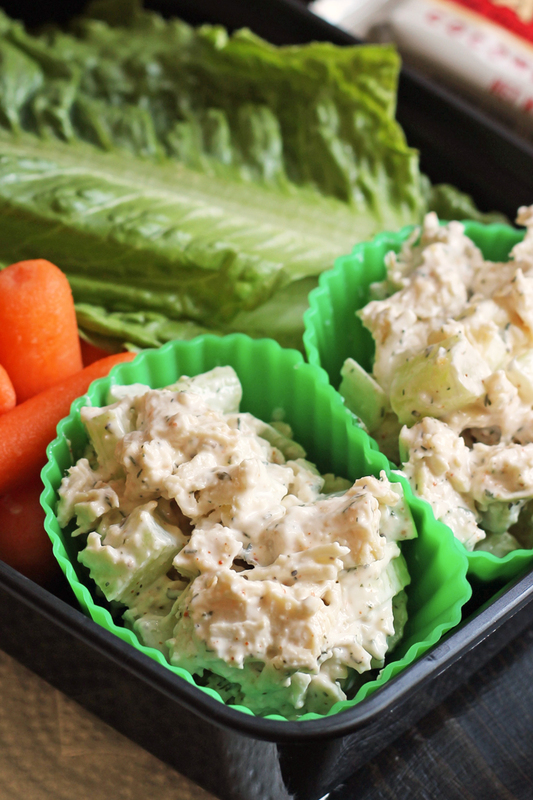 Serve this easy chicken salad in lettuce wraps or atop rolls. So yummy! This creamy chicken salad gets a kick from a custom blend and crunch from crisp celery. It’s great in lettuce wraps or on rolls. In a mixing bowl combine the chicken, mayonnaise, celery, and spice mix. Adjust seasonings to taste. Chill before serving in lettuce wraps or on rolls. You can make this salad up to 2 days in advance. If you’re packing it for sandwiches, store it in a dish separate from the bread or lettuce leaves in order to keep them from getting soggy. This is similar to my favorite chicken salad, only we add chopped apple and craisins instead of the cajun spice! My daughter spreads it on toast, I eat it with crackers. YUM! Sounds delicious! Thanks for the tips! Sounds delicious! Love the idea of the apricots. Gonna try that. I just mixed this up for myself – needed a quick lunch – and it was quite tasty! I had your Cajun spice mix and cooked chicken in the freezer. Served on toasted homemade rye bread with a layer of baby spinach leaves. Yum!